Here’s another one for all of you interested in the “grow your own food” movement which is growing rapidly around the globe. These two great guys, Alejandro Velez & Nikhil Arora, who founded “Back to the Roots”, a company that sells grow-your-own-oyster-mushrooms-kits, are at it again. This time they are finally presenting a product long overdue: HOME AQUAPONICS GARDEN. Aquaponics is the combination of aquaculture with hydroponics. The waste (yes, the pee and poo) from the fish is filtered through plant roots, providing essential nutrients to the plants, which in turn filter the water and keep it clean. Although most commercial aquaponics operations include fish that can be harvested for food, the Back to the Roots model is small enough that you would probably only want to use goldfish or other small fish. However, you can harvest all the herbs you desire from the top of the unit. 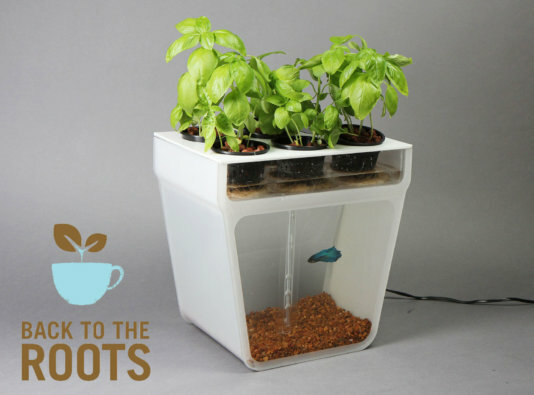 Back in November, Back to the Roots launched a successful Kickstarter campaign for the home aquaponics kit, raising nearly $250,000 to fund the production of the tanks. The kit, which includes a tank with an air pump to deliver nutrients to the plants, a mix of herb seeds, fish food, and pebbles, is now available for preorder for $60. Velez & Arora are both UC Berkeley undergrads who dropped plans to go into investment banking and consulting and instead launched a business around growing mushrooms in recycled coffee grounds. By mixing good design with local food production, they were able to make growing mushrooms fun and accessible to people around the world. Now, the hope is that Nikhil and Alejandro will be able to do for aquaponics what they did for mushrooms.